Wrapping up my sixth edition of AutoCAD and AutoCAD LT: No Experience Required; few things can top the excitement of sharing months of hard work that, as an author, I sincerely hope will help others get a footing in the industry – much as I did many years ago. I emphasize few things can top that excitement because Shaan Hurley, longtime friend and Between The Lines blogger, recently spotlighted one of those moments that even exceed the definition of excitement. My wife and I just celebrated the 1-month birthday of our first child, a baby boy, that we chose to name Jackson. Joining in the festivities (and the subject of Shaan’s blog post) was the outfit my company, CADD Microsystems, had made for our little guy. 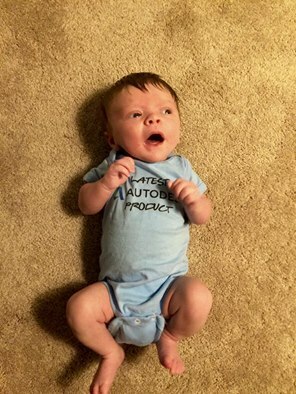 The outfit that set off an incredibly geeky Facebook thread simply reads “Latest Autodesk Product.” Needless to say, my wife and I couldn’t be more excited to welcome Jackson into our lives, and I certainly can’t wait until the day I get to begin teaching him about design. In the spirit of children, I thought I’d share a quick tip on creating and using Child Dimension Styles. If you’re not familiar with the concept, Child Dimension Styles are an absolute necessity when you need to change the appearance for different types of dimensions. As an example, many architectural plans use Architectural Ticks for linear dimensions, but an Arrow may be more appropriate for Radius dimensions. In lieu of creating a different style for Linear and Radius dimensions, Child Dimension Styles can capture both dimension types into a single (centrally managed) dimension style. Have a look at the video to learn how. Where did the Coordinate readout in the AutoCAD status bar go?